July and August are summer's hottest months; tough on your air conditioning system, your comfort, and your electricity bill. Inside your home, heat rises to the top floors and gets trapped, creating ‘hot zones' far away from your thermostat. This makes it hard to keep your family comfortable throughout the day while still managing your energy costs. Most homeowners simply blast their house with air conditioning until the hottest rooms are cool, creating large bills and enormous inefficiencies. 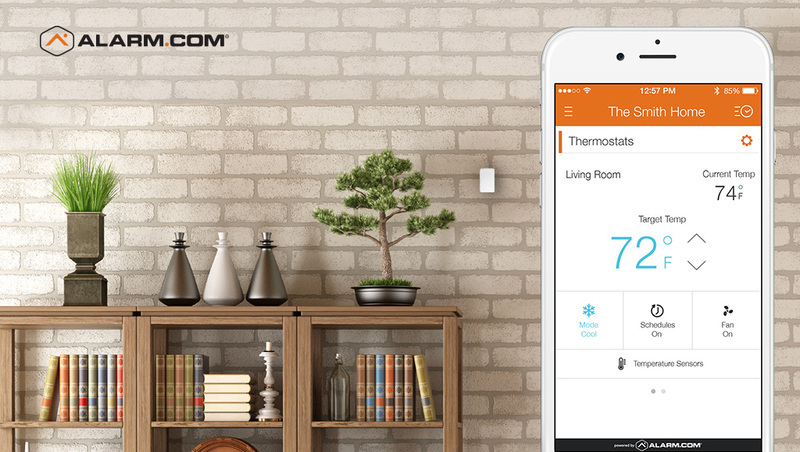 Remote temperature sensors can be placed on the wall of any room. They give your Alarm.com Smart Thermostat the ability to read the temperature in that room, which also allows it to target the temperature in that room. If you want your bedroom cooled to 72 degrees, for example, the thermostat will target your bedroom specifically, and cool your home until the bedroom's temperature sensor registers a perfect 72 degrees. It's worth having remote temperature sensor in each of the main rooms your family spends the most time in, including the living room / family room and your master bedroom. If you have young children, place one in their bedroom or nursery. 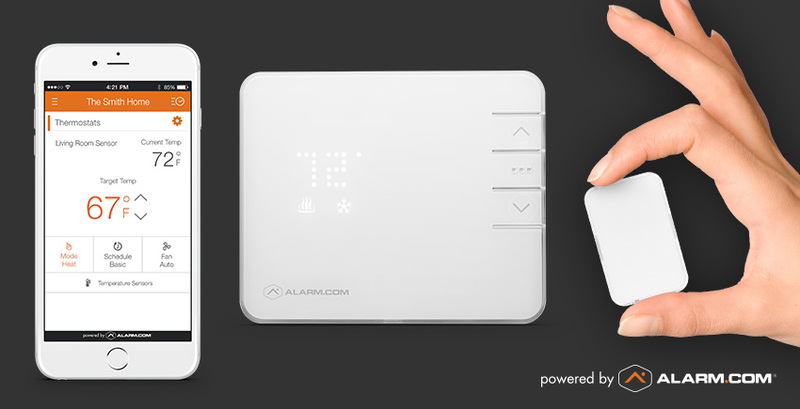 Your Alarm.com dealer can show you the ideal location for a remote temperature sensor in any each room, where it will reflect the most accurate reading of the room's temperature. 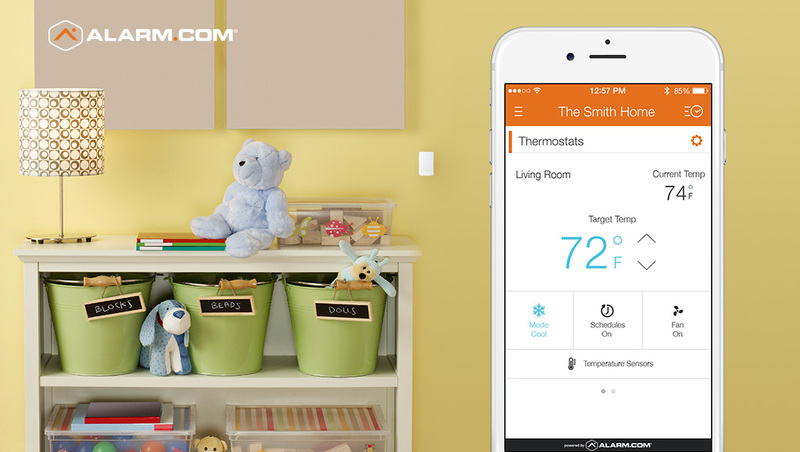 You can now have your thermostat target any room with a remote temperature sensor. You can change your target rooms manually, but the easiest way to do it is with a schedule. Alarm.com makes it easy to create a schedule targeting different rooms at different times, based on your family's routine. For example, you can target the master bedroom between 10pm and 6am for a cool night, switching back to the main thermostat downstairs when it's time to get up. When your kids arrive home from camp in the afternoon, you can have your living room sensor take over. At 10pm, the bedroom sensor will take over again. In this way, your ideal temperature 'follows' you and your family around the home. Precision comfort helps conserve energy by delivering just the amount of cooling that you need, and no more. In addition, however, there are many more ways to save energy with an Alarm.com Smart Thermostat. Auto-setback monitors your doors and windows for potential energy waste: if you (or your kids) leave a door open, your thermostat will alert you, and automatically set back to minimize energy waste until you close it. Geo-Services uses your smartphone's location to set your thermostat to ‘savings' mode automatically when you leave the house, and to ‘comfort' mode when you're on your way home. You leave a comfortable home, and return to a comfortable home, but consume less energy overall. Finally, on the hottest days of all, our Extreme Temps feature gives you the option of automatically setting your thermostat to a degree or two higher when the temperature outside reaches a certain threshold. This subtly reduces the amount of energy your AC uses during the hottest hours of the day, without impacting your comfort too much. 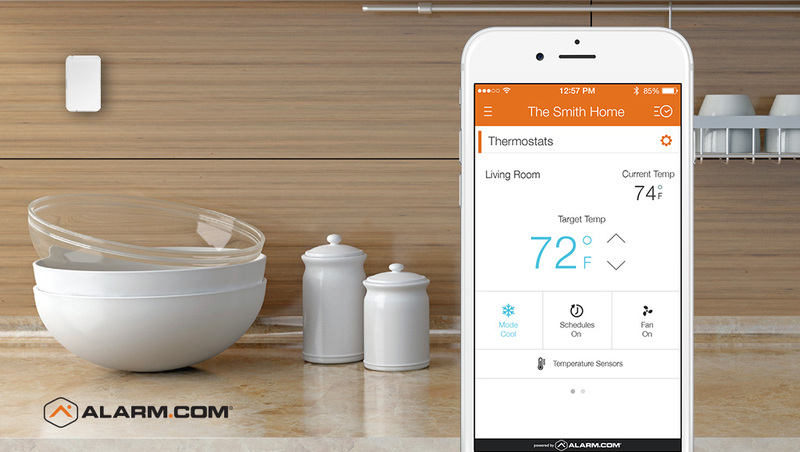 To find out more about our Smart Thermostat, click here.